The Sylvestre Glass Ornament by Caroline Ziegler & Pierre Brichet. 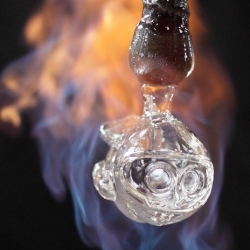 The blown glass Christmas ornament was created for the Centre International d'Art Verrier (CIAV) glass museum and workshop in Meisenthal, France. Find out more from CIAV and MocoLoco.